My most recent exhibition was with Panter and Hall, Pall Mall, London. The exhibition ran from 11th September to 27th September 2013. The entire exhibition can still be seen on their website www.panterandhall.com. "Sue’s interiors are visual feasts. Her delicate brush strokes bring every surface to life in these deliberately opulent settings - capturing the play of light from lamps or open fires, and how that light transforms the colours of furnishings and walls. From the warm red-orange glow of an evening fireside to the cooler morning sunlight brightening a hallway, her paintings depict happy, inviting places. 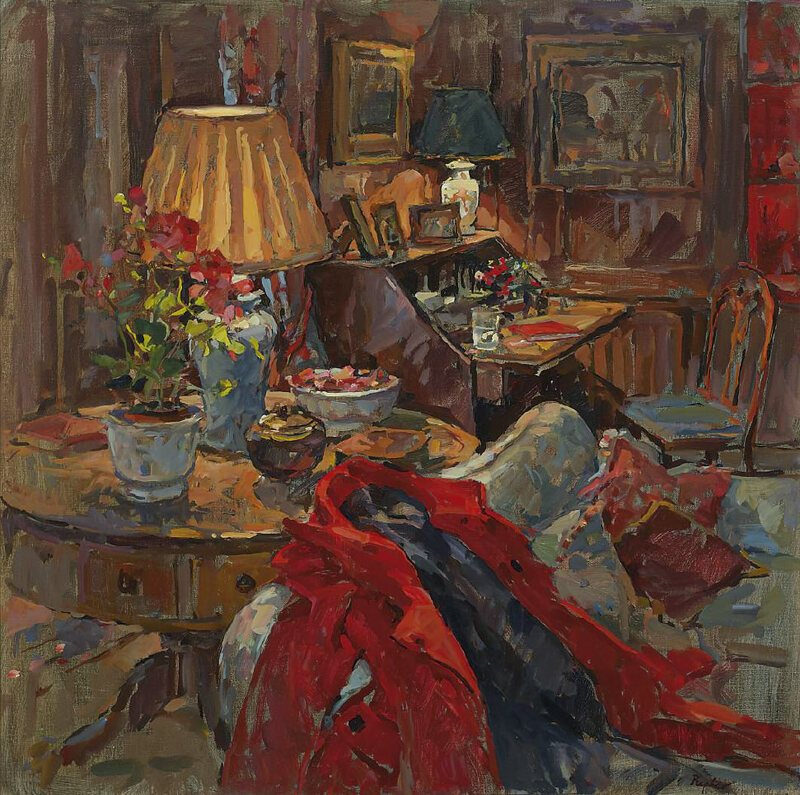 If her expert manipulation of light and colour convey this mood so successfully it is her clever compositional arrangements that add narrative. Sue’s paintings are suffused with evidence of life and activity: an open door, a hastily discarded coat, a recently abandoned card game all ask questions. Each room is left with the imprint of humanity, the shadow of an event enjoyed, a room to be returned to. Sue’s rooms and gardens are never empty, rather filled with the echoes of good company and humour, so that each setting develops a character its own. Perhaps what comes across most in her work is the evident pleasure Sue takes in painting them. The luxuriant fabrics, the patina on a centuries old table, are all lovingly recorded in paint while the distinctive lack of figures may be her greatest indulgence. One of the country’s leading portrait painters has found solace by freeing herself from the discipline of a central character. After a lifetime studying people, figures and faces there is no wonder she enjoys the tranquillity of an unpopulated room."